A new study published in Toxicology and Applied Pharmacology titled, "Malignant human cell transformation of Marcellus Shale gas drilling flow back water," is the first study of its kind to confirm widely held suspicions concerning the carcinogenicity of fracking pollution. The new collaborative study was conducted by scientists at esteemed institutions in both the U.S. and China and found that so-called "flow back" fracking wastewater induced malignant changes in human bronchial epithelial cells consistent with the cancerous phenotype. The same fracking wastewater was injected into mice, with 5 of the 6 developing .2 cm to .6 cm tumors as early as 3 months after injection, and with the control mice forming no tumors after 6 months. The authors concluded that their results indicate "flow back water is capable of neoplastic transformation in vitro," i.e. fracking wastewater is capable of producing cancer in mammals. Natural gas is believed to possibly be a bridge to transitioning from coal dependence. Currently natural gas fuels nearly 40% of the U.S. electricity generation, and the Marcellus Shale formation in the Appalachian Basin is on the forefront of gas-shale drilling for natural gas production in the United States (Pritz, 2010). Mining natural gas is not new, but the volume has soared in recent years because the new technique of high-volume horizontal hydraulic fracturing (HVHHF). The concern surrounding the environmental, public health and social impacts of this method has increased accordingly. HVHHF is an advanced technology that injects water, sand, and other ingredients at very high pressure vertically into a well about 6000 to 10,000 ft deep (Penningroth et al., 2013). The high pressure creates small fractures in the rock that extend out as far as 1000 ft away from the well. The pressure is reduced after the fractures are created, which allows water from the well to return to the surface, also known as flow back water (Veil, 2010). The flow back water contains complex proprietary chemical mixtures, but also naturally occurring toxins such as metals, volatile organics, and radioactive compounds that are destabilized during gas extraction (Warner et al., 2012). On average, about 5.5 million gallons of water is used on average to hydraulically fracture each shale gas well, and 30% to 70% of the volume returns as flow back water (Veil, 2010). Currently discharge options of flow back water are: inject underground through an onsite or offsite disposal well; discharge to a nearby surface water body; transport to a municipal wastewater treatment plant or publicly owned treatment works; transport to a commercial industrial wastewa- ter treatment facility; and/or reuse for a future hydraulic fracturing job either with or without some remediation (Pritz, 2010). Some commercial wastewater disposal facilities accept flow back and discharge the water after treatment under their own national pollutant discharge elimination system permits (Veil, 2010). The implications of the data presented above are truly harrowing. Pennsylvania, alone, has over 7,700 active wells in use at present. Over 4,000 violations have been reported, and over 6 million in fines paid out thus far. The operation of these Pennyslvania wells require about 42 billion gallons of water, and according to the figures above, would together produce between 1.4 and 6 billion gallons of flow back wastewater. Despite the massive scale of toxic pollution generated by the fracking industry, they have been highly successful in deceiving the public by calling its product "natural gas" -- a typical green-washing technique. The truth is that the Marcellus Shale formation in the Appalachian Basin, which is by far the #1 producer of "natural gas" in the US, and which uses the increasingly widespread fracking technique known as high-volume horizontal hydraulic fracking (HVHHF), is responsible for producing not only massive fracking chemical and heavy metal pollution, but radioactive waste as well. Read my report, "Fracking Creates Massive Radioactive Waste Problem," to learn about how the fracking of the Marcellus Shale is releasing highly carcinogenic radioactive waste into the environment on an unprecedented scale. The new study addresses the radioactivity concern by noting that their test wastewater, "may not be truly representative as it was aged prior to the physical–chemical characterization necessary in this set of experiments; and thus neither significant amount of radioactivity or organic compounds was present." In other words, the carcinogenicity of fracking pollution may be far higher than observed in this study i radioactive components are taken into account. The primary "carcinogenic" elements identified in the test wastewater were barium and strontium, which are two alkaline minerals that mimic calcium in living organisms and therefore are freely taken up by cells. These elements are naturally found in the Marcellus Shale, but are released in far higher than natural concentrations into wastewater as contaminants only after fracking. Our work has provided the first line of evidence that Marcellus Shale flow back water induces malignant cell transformation in vitro. The BEAS-2B cells exposed to flow back water up to six weeks appeared to be transformed and exhibiting altered morphology as compared to parental cells. The present work also provided Ba and Sr as hydraulic fracturing-related target pollutants in addition to the more classically- studied fracking contaminants (i.e., radioisotopes and methane) for fur- ther investigation. Research to determine whether fracking-associated pollutants can migrate to private or public drinking wells, to identify early warning indicators of exposure and effect, and to identify suitable remediation approaches are urgently needed. Descriptive and analytical epidemiological studies along with animal model studies will help to better understand the health impact associated with unconventional shale gas production. The fracking industry likes to call its product “natural gas,” but the natural consequence of its activity is the production of billions of gallons of cancer-causing wastewater. A new study published in Toxicology and Applied Pharmacology titled, “Malignant human cell transformation of Marcellus Shale gas drilling flow back water,” is the first study of its kind to confirm widely held suspicions concerning the carcinogenicity of fracking pollution. The new collaborative study was conducted by scientists at esteemed institutions in both the U.S. and China and found that so-called “flow back” fracking wastewater induced malignant changes in human bronchial epithelial cells consistent with the cancerous phenotype. The same fracking wastewater was injected into mice, with 5 of the 6 developing .2 cm to .6 cm tumors as early as 3 months after injection, and with the control mice forming no tumors after 6 months. The authors concluded that their results indicate “flow back water is capable of neoplastic transformation in vitro,” i.e. fracking wastewater is capable of producing cancer in mammals. Despite the massive scale of toxic pollution generated by the fracking industry, they have been highly successful in deceiving the public by calling its product “natural gas” — a typical green-washing technique. The truth is that the Marcellus Shale formation in the Appalachian Basin, which is by far the #1 producer of “natural gas” in the US, and which uses the increasingly widespread fracking technique known as high-volume horizontal hydraulic fracking (HVHHF), is responsible for producing not only massive fracking chemical and heavy metal pollution, but radioactive waste as well. 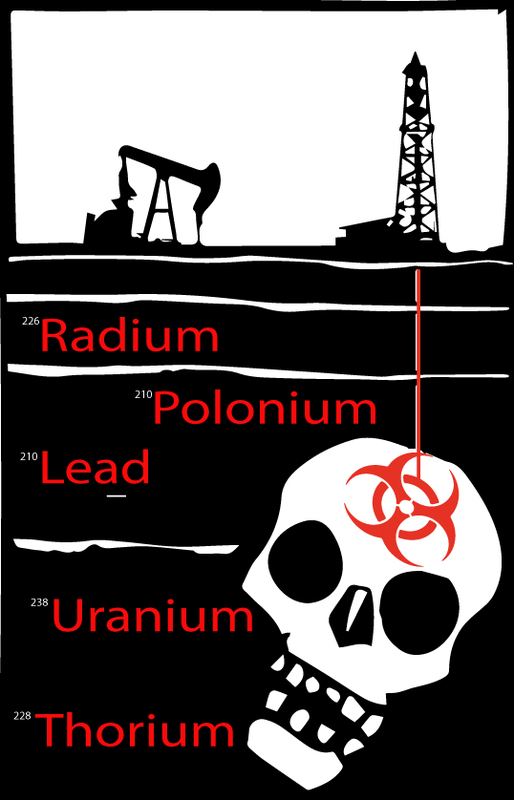 Read my report, “Fracking Creates Massive Radioactive Waste Problem,” to learn about how the fracking of the Marcellus Shale is releasing highly carcinogenic radioactive waste into the environment on an unprecedented scale. The new study addresses the radioactivity concern by noting that their test wastewater, “may not be truly representative as it was aged prior to the physical–chemical characterization necessary in this set of experiments; and thus neither significant amount of radioactivity or organic compounds was present.” In other words, the carcinogenicity of fracking pollution may be far higher than observed in this study i radioactive components are taken into account. The primary “carcinogenic” elements identified in the test wastewater were barium and strontium, which are two alkaline minerals that mimic calcium in living organisms and therefore are freely taken up by cells. These elements are naturally found in the Marcellus Shale, but are released in far higher than natural concentrations into wastewater as contaminants only after fracking.